Lumps on the gums can be scary, but it also might be nothing. Know how to tell if the lump is a serious problem or something that will go away with time. Have you ever noticed a lump on your gums? 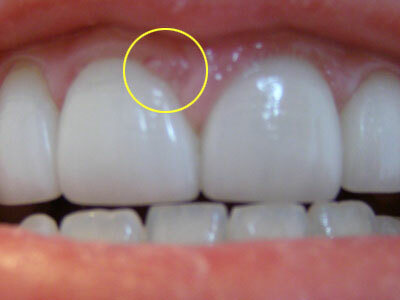 Sometimes a lump on the gums is a very mild condition that goes away after a few days. But if the lump on your gums stays for a while, it might mean there is bacterial growth underneath the lump. It could also mean that you have an abscessed tooth. This is important to take care of as soon as possible, because an infection of this kind can spread to your surrounding teeth and even to your bloodstream, where it can begin to cause symptoms throughout your body. What Causes Lump on Gums? Sometimes a simple irritation of one particular area can lead to a lump on the gums. This often happens if you have had something in your mouth pressing against one spot, or if you have a habit of moving your teeth in such a way that they scrape against the opposite gum. These irritations might lead to your immune system forming a lump to try to protect the area. These ulcers are quite common and can be caused by numerous things, such as spicy foods, infection, and even excessive body heat. They might be white and painful, pink or red, and often appear as a lump. This gum disease begins with inflammation, which can feel like lumps along the gums, then becomes worse without treatment. The bacteria are slowly eating away at the surrounding tissue. A lump on the gums often appears after a tooth extraction. This could be a blood clot that forms there during healing, or simply because of irritation to the area, which will go away within a few days. What Are the Symptoms of Lump on Gums? A lump on the gums can indicate something very simple or something serious. Infections might appear as a mass on the gums, and they can also have pain and swelling, and you might run a high fever. Sometimes oral cancers appear as a lump on the gums, and that’s why you should always have a lump on the gums checked out, regardless of the reasons for it. Some of the more common reasons for lumps on the gums are canker sores, which happen to a great number of people, and those tend to go away on their own or with over the counter medications. Traumatic injuries, including having a tooth extracted, can also lead to pain, tenderness and lumps. Occasionally the hormonal changes of pregnancy can lead to lumps in the mouth, and those tend to go away as soon as the woman delivers her baby. A lump on your gums can be painful, annoying and frightening. Here are ways to help fight it. When you are dealing with the pain of a lump, salt water rinses can help the pain go away. Using clove oil on the spot can also bring some relief. Over the counter medications, such as ibuprofen or acetaminophen, can also make a difference. Try using mouthwashes with a high alcohol content or a blend of hydrogen peroxide and water to gargle – remember not to swallow these concoctions! Antibiotics are often prescribed for problems like this. The antibiotics can often deliver relief within 24 to 48 hours, and once the swelling goes down, the dentist might want to remove the tooth or do other procedures to ensure the problem is gone. If the problem is very serious, your dentist might perform minor surgery to help you get over the issue. Scaling and root planing are the first options, and if that doesn’t work, a root canal might be in order. If that doesn’t work, tooth extraction or periodontal surgery might be required. Keep your teeth very clean by brushing and flossing every day, and using mouthwash with a good alcohol content to clean and freshen your mouth after you brush. This can help avoid the formation of pockets that hold bacteria. Keep up with regular dental visits for cleaning and x-rays. This can help avoid problems by spotting them before they start. If you are suffering from pain while chewing, swelling of your jaw, or trouble opening your mouth, it’s time to see a doctor. Other problems that should send you to the dentist include a bad odor from the mouth that won’t go away with mouthwash use, occasional bleeding from the gums, and fever or other signs of infection. Removing lump on gums and maintaining gum health can be easier with these tips. Smokers have a much higher incidence of gum disease, and might have problems with bleeding and swollen gums. These constant irritations can cause serious tooth problems, and smoking can also lead to oral cancer. Brush and floss every day, at least in the morning and before going to sleep. Meet with your dentist for a cleaning at least every six months. An electric toothbrush can help, as can a soft-bristled brush that doesn’t irritate your gums. Be sure to brush all sides of your teeth and use floss to get into the hard-to-reach places. Replace the toothbrush when it becomes worn or frayed, or after you have had a cold. Never store your toothbrush in a covered container, as that invites bacterial growth.